The standard Hebrew term for a blind person is (Heb. עִוֵּר) (ʿivver; Ex. 4:11; et al. ), a noun in the form used for bodily defects. The abstract form is עִוָּרוֹן (ʿivvaron, "blindness"; Deut. 28:28; Zech. 12:4). The word סַנְוֵרִים (sanverim; Gen. 19:11; II Kings 6:18), sometimes incorrectly translated "blindness," means a blinding light causing (possibly temporary) loss of vision (E.A. Speiser). Eyes which cannot see are described by the verbs כהה ("be dim"; Gen. 27:1; et al. ), קוּם ("be fixed," "still"; I Sam. 4:15; I Kings 14:4), חשך ("be darkened"; Lam. 5:17; et al. ), כבד ("be heavy"; Gen. 48:10), and שעע and טחח ("be smeared over;" Isa. 6:10, 32:3; 44:18; et al.). Genesis 29:17 describes Leah's eyes as rakkot, but whether this means "tender" or "weak" is moot. Blindness was widespread in the ancient Near East. Preventive techniques included the application of hygienic ointments, especially kohl, and surgical operations (cf. The Code of Hammurapi, 215–20 in Pritchard, Texts, 175). (There is no evidence that the biblical injunction against eating pork was intended or understood to prevent trichinosis or other diseases which cause blindness.) Biblical cases include Isaac (Gen. 27:1), Jacob (Gen. 48:10), Eli (I Sam. 3:2; 4:15), and Ahijah the Shilonite (I Kings 14:4), all of whose eyesight failed in old age. (Deut. 34:7 makes a point of reporting that Moses' eyesight had not failed in old age.) Both Isaac and Jacob in their blindness reversed the status of a younger and an older descendant in blessing them (Gen. 27 (cf. 29:23–6); 48:8–19). Aside from old age, natural causes of blindness are not mentioned in the Bible. In a few passages blindness is mentioned as a punishment inflicted by God: it is threatened for Israel's violation of the covenant (Deut. 28:28–29; M. Weinfeld takes this passage metaphorically; see below) and for the "negligent shepherd" of Zechariah 11:15–17; Proverbs (30:17) warns that the eye which is disrespectful to parents will be plucked out by birds of prey (cf. The Code of Hammurapi, 193, in Pritchard, Texts, 175). Theologically speaking, all cases of blindness are attributed to God (Ex. 4:11), just as the restoration of sight is credited to Him (Ps. 146:8). However, outside of the specific cases mentioned, blindness in general is nowhere stated to be a punishment for sin. In a few passages God strikes His servants' assailants with blinding flashes (Gen. 19:11; II Kings 6:18–20) or permanent blindness (Zech. 12:4; Ps. 69:24) in order to protect His servants. As a punishment inflicted by human agency one finds the penalty of "an eye for an eye" in the talion formula (Ex. 21:24; Lev. 24:20; Deut. 19:21), although it is debated whether this was ever carried out literally in Israel (cf. The Code of Hammurapi, 196–9, where the relation of the law to actual practice is similarly uncertain). Samson and King Zedekiah were blinded, respectively, by the Philistines and Nebuchadnezzar (Judg. 16:21; II Kings 25:7; Jer. 39:7; 52:11). Nahash the Ammonite demanded the putting out of the right eye of all the people of Jabesh-Gilead as a condition for sparing the city (I Sam. 11:2). Several passages speak of the eyes being "spent" or "pining away" from tears and grief. The verb used is usually כלה ("Be spent"); the context makes it clear that soreness rather than blindness is meant (e.g., Lev. 26:16; Deut. 28:65; Jer. 14:6; Lam. 2:11; 4:17; cf. also עשש, Ps. 6:8, "be spent," "waste away"). Blind persons are naturally helpless in many ways (cf. II Sam. 5:6; Isa. 35:5–6; Jer. 31:7, which invoke the blind, the lame, and the mute as representative examples of helplessness) and subject to exploitation (Deut. 28:29). Biblical ethics warned against exploiting them (Lev. 19:14; Deut. 27:18; Job 29:15). As a physical defect blindness disqualified priests from sacrificing or approaching the altar (Lev. 21:17–23) and rendered sacrificial animals unacceptable (Lev. 22:21–22; Deut. 15:21; Mal. 1:8). Some have taken the enigmatic saying "the blind and the lame shall not come into the house" (II Sam. 5:8) to indicate that at one time these were forbidden entranceto temples. 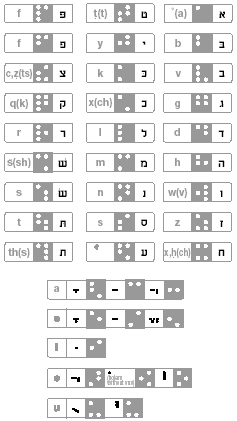 The Hebrew Braille system adopted universally in the 1950s. helplessness and exploitability of the blind made blindness a natural metaphor for oppression and injustice in Deuteronomy 28:28–29 and Isaiah 59:9–10 (cf. Lam. 4:14; M. Weinfeld has noted that the association of blindness and darkness with oppression in these passages also reflects the Mesopotamian association of the sun-god with justice (cf. a related association in II Sam. 23:3–4; Hos. 6:5b; Zeph. 3:5)). A related metaphor is the use of blindness to describe those who dwell in the darkness of prison or captivity (Isa. 42:7, 16–19; 43:8; 49:9; 61:1; cf. Ps. 146:7–8; this use has roots in Mesopotamian royal inscriptions). The unusually large number of talmudic sages who were blind probably reflects the wide prevalence of this disability in ancient times. In addition to Bava b. Buta, who was blinded by Herod (BB 4a), mention may be made of Nahum of Gimzo (Ta'an. 21a), Dosa b. Harkinas (Yev. 16a), and R. Joseph and R. Sheshet in Babylon (BK 87a), as well as a number of anonymous blind scholars (cf. Ḥag. 5b; tj Pe'ah, end). Matya b. Heresh is said to have deliberately blinded himself to avoid temptation, but his sight was subsequently restored by the angel Raphael (Tanḥ. B., ed. Buber, addition to Ḥxukkat). The talmudic name for a blind man is suma (Ḥag. 1:1; Meg. 4:6), but the euphemism sagi nahor ("with excess of light") is often used (Ber. 58a. ; TJ Pe'ah end; and especially Lev. R. 34:13 "the suma whom we call sagi nahor"). Unlike the deaf-mute, who is regarded in Jewish law as subnormal, the blind person is regarded as fully normal, and most of the legal and religious restrictions placed upon him are due to the limitations caused by his physical disability. The statement (Ned. 64b) based on Lamentations 3:6 – "He hath made me to dwell in darkness as those that have been long dead" – that "the blind man is regarded as dead," is of purely homiletic interest and has no practical application. In the second century R. Judah expressed the opinion that a blind man was exempt from all religious obligations, and as late as the time of the blind Babylonian amora Joseph (fourth century) the halakhah had not yet been determined (see his moving statement in bk 87a), but it was subsequently decided against his view. Even the statement of R. Judah that a person blind from birth cannot recite the Shema, since the first of the two introductory blessings is for the daily renewal of light (Meg. 4:6; TB Meg. 24a), was later amended since he enjoys the benefit of light (Rosh, resp. 4:21); the law that a blind man could not be called up to the reading of the Torah, since the passage must be read from the scroll (OḤ 53:14), was abolished with the institution of the ba'al kore, who reads the passage for those called up (Taz. to OḤ 141:1). The ruling of Jair Ḥayyim Bacharach (Ḥavvot Ya'ir 176) that if there were a person more suitable, a blind person should not conduct the service is an individual opinion and Yehudai Gaon, who himself was blind, gives a contrary opinion (J. Mueller, Mafte'aḥ li-Teshuvot ha-Ge'onim (1891), 67). Similarly, although it was laid down that a totally blind person may not act as a judge, it is stated that when R. Johananheard of a blind man acting as judge he did not forbid it (Sanh. 34b, cf. ḤM 7:2; for instances in the Middle Ages see Pahad Yiẓḥak S.V. Suma). Even as late as the time of Joseph Caro in the 16th century, it was laid down that a blind person is forbidden to act as a shoḥet only "in the first instance"; the total prohibition was enacted later (YD 1:9 and commentaries). A special case was the exemption of a blind person from the duty of going up to Jerusalem on the Pilgrim Festivals. The special nature of this law, which is derived from the homiletical interpretation of a word, is seen in the fact that it applied even to a person blind in only one eye (Ḥag. 1:1, and TB Ḥag. 2a). During the Middle Ages, blinding was imposed by some battei din as a form of extrajudicial punishment and was condoned by contemporary rabbis (Assaf in bibl. nos. 97, 98, 135). Blindness was said to be caused by bloodletting at unfavorable times and by the machinations of demons (see Zimmels in bibl., pp. 88 and 153). The question has been raised in recent times as to the permissibility of removing the cornea of a deceased person and grafting it on a blind person to restore his sight. Halakhic opinion is almost unanimously in favor, and in a responsum I.J. Unterman added the consideration that the danger to the life of a blind person through accidents is such that it can be regarded as a special case of pikku'aḥ nefesh (see *Autopsy ). The Jewish blind have been traditionally assisted by regular communal and voluntary agencies and associations, as well as special institutions. In the United States the New York Guild for the Jewish Blind, founded around 1908, had a home for aged blind, has offered integrated services to the visually handicapped, and has initiated a nonsegregated living plan for the blind. In the United Kingdom the central agency was the Jewish Blind (now Jewish Blind and Disabled) Society in London, founded in 1819. By 1970 it was caring for the needs of over 1,500 Jewish blind. It maintained a number of residential and holiday facilities, day centers in provincial cities, and the Burr Center for Personal Development which offered various courses for the blind and disabled. The special conditions in Israel as a country of immigration created the problem that the proportion of blind persons of working age in the state was three times higher than in Anglo-Saxon countries (1956). Much has been done to alleviate this position, while the blind person is as far as possible not treated as a social case. He is, however, exempted from paying income tax. Special placement officers facilitate his employment. In 1956 the proportion of blind to ordinary residents was estimated at approximately 2.5 per 1,000; 87% of them had immigrated after 1948. Over 85% were born in countries of Asia and Africa where in many cases the blind were not cared for or enabled to work. There was a comparatively high proportion of married women or widows due to marriage of blind girls to elderly men. The Jewish Institute for the Blind in Jerusalem, founded in 1902, cared for the majority of blind children in the country. It included a kindergarten, elementary school where subjects were taught in braille, and boarding facilities for 60–90 pupils attending regular secondary school. It also had a vocational school, industrial training shop, a braille printing press, and two houses for mentally or physically handicapped blind adults. Other agencies and associations for help of the blind in Israel included Migdal Or, the American Israeli Lighthouse Rehabilitation Center for the Blind in Haifa (Kiryat Ḥayyim), which gave casework reorientation, special training and courses, and has developed home industries for blind who are physically incapacitated. The Women's League for Israel of New York assisted joint projects with the Ministry of Social Welfare for rehabilitation of blind girls and women, and maintained a sheltered workshop, Orah, and a bookbindery, Malben, which in 1951 took over Kefar Uriel, a village for the blind established in 1950 by the Jewish Agency for blind immigrants; in 1962 it had 63 families (about 350 persons). Heads of families were employed in four workshops. The Israel Foundation for Guide Dogs for the Blind in Haifa was established around 1950. A Central Library for the Blind, established in 1952 in Netanya, had over 5,000 volumes in braille and a talking book library. The Association for the Blind and Prevention of Blindness, founded in 1953, had branches in nine centers. The National Council for the Blind, established in 1958 for coordinating, research, and planning, was represented on the World Council for the Blind. Voluntary agencies giving assistance from abroad include Hilfe fuer Blinde in Switzerland and Aide aux Aveugles Israéliens in France. Training for non-Jewish blind has also been given by the Saint Vincent Roman Catholic hostel in Jerusalem, and at handicraft centers established in Nazareth and Shefaram. Isolated Arab villages have been visited by home teachers. There is no statutory registration of blindness anywhere in the world. All comparative statistics on the incidence and causes of blindness are therefore largely speculative, and this applies in particular to statistics on blindness in Jews, for whom data are usually lacking in whatever national statistics are available. Comparative studies are thus impossible, and little more than some generalizations can be advanced. The incidence and causes of blindness in most parts of the world are determined essentially by environmental factors. Jews, as a widely dispersed community, therefore suffer from the locally prevailing environmental causes of blindness. In this respect, if the incidence of blindness in a particular Jewish community is different from that in the general population, it will merely reflect the differences found in the various social groupings of the population at large. Thus it occurs in all countries where trachoma is endemic. The disease is more prevalent in rural areas, ill provided with sanitation and health services, than in the more developed urban centers with their populations relatively well housed and well served medically. The high incidence of trachoma in Oriental Jews who immigrated to Israel reflects country of origin and social level, rather than their Jewishness. In the more highly developed countries, infections and other environmental causes of blindness are steadily declining, and most cases of blindness are now due to affections seen in the elderly (such as "senile" cataract and "senile" macular degeneration) or in the middle-aged (such as glaucoma and, to a lesser extent, myopic atrophy, uveitis, and diabetic retinopathy). These are all "constitutional" diseases, and clinical experience in Western Europe and the United States has brought out a greater incidence of three of these affections in Jews: myopia, diabetic retinopathy, and Tay-Sachs disease, a rare lethal disorder. Although adequate statistics are lacking, this clinical experience is probably well-founded and would be readily explained by the fact that these three affections are all genetically determined, generally by recessive or by polygenic inheritance. Although there is no such thing as a Jewish gene pool, it is true that inbred groups – Quakers no less than Jews and royal families no less than village communities – have many features and genes in common. These are readily perpetuated under the prevailing conditions: a recessive mutant gene is much more likely to spread in a closed community than elsewhere. (The gene for Tay-Sachs disease probably originated as such a mutant in a Jewish family in White Russia during the last century, and by emigration, carriers have spread it into the Jewish communities of Great Britain and the United States.) Contrary to early beliefs, the affection is not exclusively Jewish, for it is seen in other ethnic groups as well. These occasional cases do not add substantially to the instances of hereditary blindness in Jews, and it is a moot point whether the greater incidence of blindness from high myopia and diabetic retinopathy in Western Jews adds to that load. The numbers involved would be relatively slight, and compensating deficiencies in other hereditary causes are theoretically possible; actual data are lacking, however. See section on Braille in *Alphabet, Hebrew . Gordon, in: Archives of Ophthalmology, 9 (1933), 751ff. ; E.A. Speiser, Genesis (1964), 139 (on Gen. 19:11); idem, in: JCS, 6 (1952), 81ff. (esp., 89 n. 52); Harrison, in: IDB, 1 (1962), 448–9; M.Z. Segal, Sifrei Shemu'el (1964), 260, 262 (on II Sam. 5:6, 8); Weinfeld, in: Biblica, 46 (1965), 420–1; Paul, in: JAOS, 88 (1968), 182; H.J. Zimmels, Magicians, Theologians and Doctors (1952), 461 notes; S. Assaf, Ha-Onshin Aḥarei Ḥatimat ha-Talmud (1922), 97 98, 135.